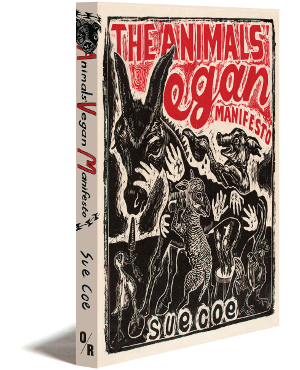 In 115 black-and-white woodcut illustrations for The Animals’ Vegan Manifesto, Sue Coe unleashes an outraged cry for action that takes its rightful place alongside the other great manifestos of history. As a prize-winning artist, she bears witness to unspeakable crimes, and has long advocated that we human beings must take more responsibility for ourselves, our fellow species, and the planet. Her illustrations, in the tradition of Goya, Kollwitz, and Grosz, will be familiar to many; her paintings, drawings and prints have been exhibited in galleries and museum around the world, including New York’s Museum of Modern Art. Sue Coe grew up next to a slaughterhouse in Liverpool. She studied at the Royal College of Art in London and left for New York in 1972. Early in her career, she was featured in almost every issue of Art Spiegelman’s groundbreaking magazine Raw, and has since contributed illustrations to the New York Times, the New Yorker, The Nation, Entertainment Weekly, Time, Details, The Village Voice, Newsweek, Rolling Stone, Esquire and Mother Jones, among other publications. 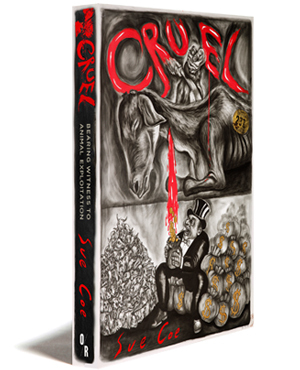 Her previous books include Dead Meat (winner of the 1991 Genesis Award) and Cruel. Among her many awards are the Dickinson College Arts Award, the Lifetime Achievement Award from the Women’s Caucus for Art, and a National Academy of Arts Award (2009).